These pix, shared by Cleopatra and Cricket’s new family, show the transforming power of patience and love. 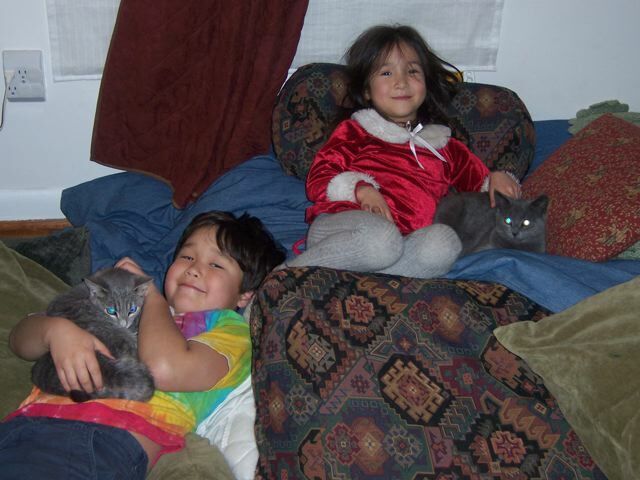 The kids knew instinctively that spending time with the kittens in their safe space was the best way to draw them out of fear and into family. And one thing is really clear: this is a family of true cat people. I hope that the success story of our Woodpile Kittens inspires others to take a chance, and help change the fate of a semi-wild or abandoned animal. The shelters are full of creatures in need, and sometimes you hear a call to service right in your own backyard. They say it’s better to give than receive, and right now I know that’s true. We just gave away the two cute little Woopile Kittens that we’ve come to know and love … and the joy and warmth we feel has made this the Best Christmas Ever. 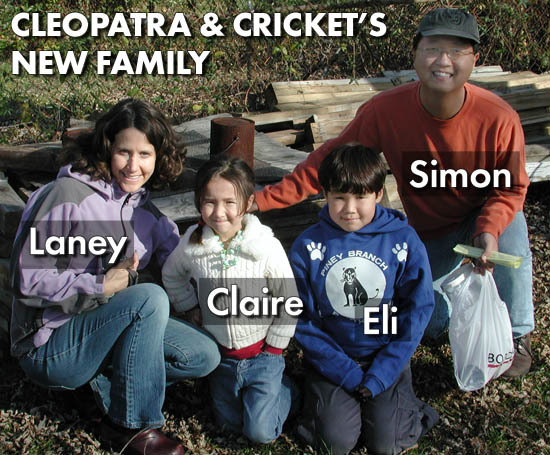 For the past five days Brett and I have been caring for Cleopatra and Cricket in our dining room. Their new family had a holiday trip scheduled, so we decided to postpone our own travel plans, bring the kitts inside, and get them further socialized and acclimated to life in a human setting. It was a little tricky at first: neither one had ever been inside, and they hid in a cardboard box for a while. As they got accustomed to the new sounds and smells they started to explore a bit. Cricket, the most gregarious of the litter, decided pretty quickly that this new world was okay. He approached me, and when I plopped him on my knee he looked up at my face with familiarity, not fear. This is the moment I call “the turn,” when a wild kitten sees you as family, not threat. It took Cleopatra a bit longer. In fact, for a while she disappeared completely. We searched the room several times, but it seemed like she had vanished into thin air! Then we noticed a flaw in our blockade – she had slipped past a large sheet of cardboard and gotten into the kitchen. Then she squeezed under the dishwasher into a narrow space beneath the kitchen floorboards. It took an hour to coax her out. But despite all the stress, Cleo soon followed Cricket’s lead: later that day she “turned” too. From then on, the two of them couldn’t get enough petting and playing. 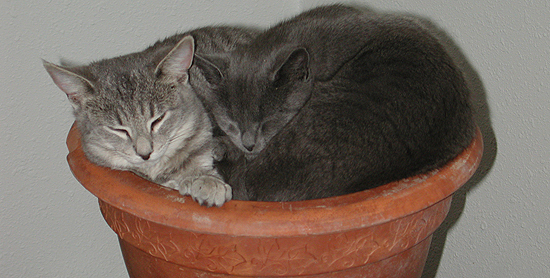 When Brett and I left their room they romped together, then rested together, cuddled up in a flower pot or burrowed beneath one of the kids’ blankets the family had left with us. The big day came today, Christmas Day. And the kitts were really ready. The family had flown in on the red-eye at 3 am, and showed up at our place at noon. 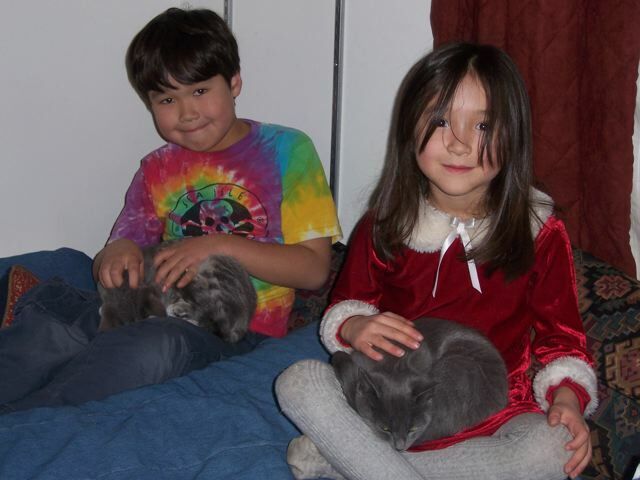 The parents looked a little bleary eyed, but the kids (Claire, 5; and Eli, 8 ) were so excited they could hardly sit still as I offered a few tips on caring for their new animal companions. When we peeked into the dining room the kitts were sleeping in a cardboard cat carrier on Claire’s blanket. No need for my elaborate plans for getting them into carriers. I carefully closed the box up. Huddled in the warm blanket and comforted by each other’s presence, they remained calm and quiet. We suddenly noticed we were being watched. The mother cat, dubbed “Queen Anne OmegaCat” in Brett’s story (below) was perched on the window sill looking in. We all went outside to feed her – a way of saying thanks for the great kittens – and took of few pictures in front of the legendary Woodpile. Then the family gently carried their precious cargo to the minivan and drove home to enjoy the rest of this very special Christmas Day.